"My mom was an absolute wonderful person. One of her passions was baking, especially at the holidays. She made everything from homemade fudge, Pinwheel, ginger, and sugar cookies. One of my favorites during the holiday season was Pecan Tassies. I would open the tin can and get the aroma of the pecan. I couldn't wait to bite into these delicious cookies. I wanted to share my mom's Pecan Tassie recipe. Thanks for letting me share this recipe as it brings back a lot of memories of past holidays." Combine the softened cream cheese and butter, add flour and stir to combine. Chill one hour. Shape in two dozen one inch balls. Place in non greased one and 3/4 inch muffin pans. Press dough against the bottom and sides. In a small bowl, beat together the egg, brown sugar, softened butter, vanilla, and salt. Stir just until smooth. 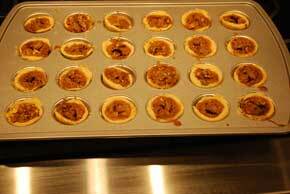 Divide the coarsely broken pecans around each muffin dough. Add the egg mixture. Top with with the remaining pecan pieces. Bake at 325'F for 25 minutes or until filling is set. Cool and remove from the pans. This recipe makes two dozen cookies. I hope you enjoy my mom's recipe and Happy Holiday!